Select Telescope: Celestron 8 SE, CPC 800, Meade LX90 8"
To Fit Celestron Nexstar 8 SE / CPC 800 / LX90 8"
It is safe to view the sun through this filter directly or mounted on a telescope, finder, spotting scope, etc. 99.999% of the sunlight is blocked. The aperture is made of a high quality, reflective coated glass and mounted into an aluminum outer cell. The filter is secured to the optical device with three nylon thumb screws. A natural yellow-orange image of the sun is viewed through the filter. It is packaged in a foam lined storage box, and included are instructions for use and care. 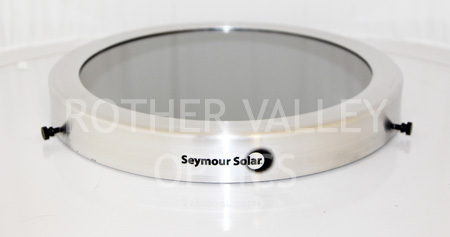 High quality glass solar filter housed in an aluminium cell. These high quality filters are type 2 glass which means you will see an orange/yellow view of the sun. These filters are designed for observing sun spots. They are very well made and are 100% safe to use as all are fully tested before dispatch. These are a push on solar filter and also have the added security of nylon set screws to ensure the best fit to your scope. To ensure you get the best fit to your scope, measure the outer diameter in inches. Then go for the next size up. For Example, if your scope measures 5.6" diameter, then the 5.75" filter will fit. To double check compatibility, please just call us or email us.